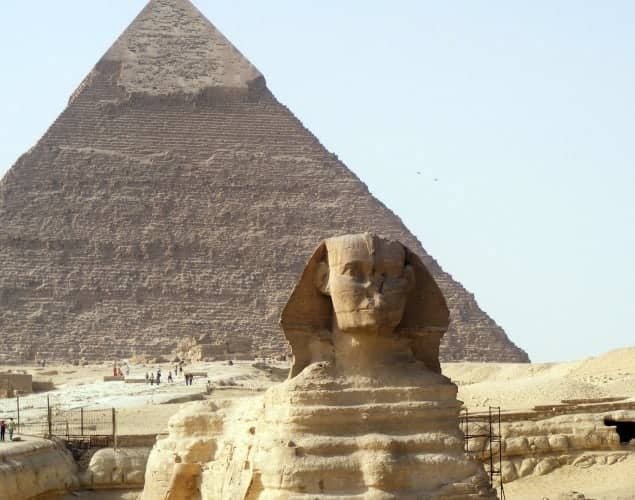 The world is obsessed with pyramids and the sphinx and hundreds of thousands of tourists flock to Egypt every year to see and touch over 5000 years worth of history. National Geographic and the most famous Egyptologist in the world Zahi Hawass (who inspired Indiana Jones) have informed and fired the imagination of many of these visitors that wander through the desert. Egypt’s inspiring work to find and catalogue its treasures has become a mission that we in the West find mesmerizing. The Pyramids of Giza turned out to be somewhat different from what I expected. Sitting at the foot of the Pyramids, lies Giza which was originally a city that overlooked Memphis which was the ancient capitol of Egypt and the Giza plateau which is part of the city became a Necropolis which means a “city of the dead” or cemetery and includes not only the pyramid tombs but several smaller Queens’s pyramids, and earlier and later graves and tombs of Egyptian dignitaries. Currently Giza is an independent subdivision or as it is known in Egypt a “governate” of the City of Cairo, similar to our subdivisions in North America. 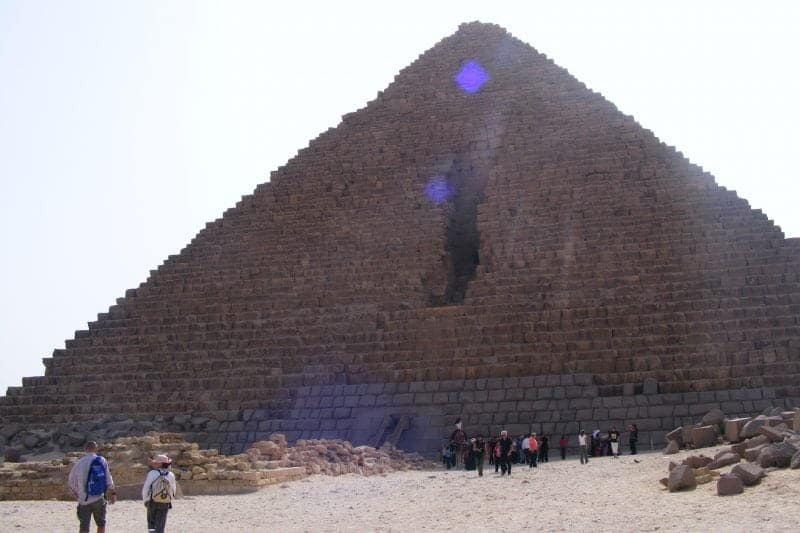 This has been a UNESCO World Heritage site since 1979 and it is an unforgettable bucket list trip, check out fellow bloggers visit in photos to Egypt here. The drive up Pyramid Road will take you by surprise, the vision of the pyramids alone in the midst of the desert that Westerners have come to expect is not particularly accurate. Pyramid Road runs just slightly east of the City and on one side of the road sits a subdivision of hotels and house and on the right the great pyramids. The peaks appear tiny in the distance and the sense of anticipation and excitement builds as the only surviving wonder of the ancient world comes into view. Entry into the plateau through the gates the cost is approximately $35 US and this includes entry into the pyramids and the Sphinx. The site itself can be disappointing there is no information or signage and the area is littered with paper, pop cans, cigarette butts and camel dung. The hawkers and touts which include men, children and uniformed officers will harass you to purchase postcards, a Gutrah (the head covering worn by Arabic men), pyramid replicas and and other cheap souvenirs, the soldiers or Police will tell you to pose and they will take your picture and then try to charge you some baksheesh. You are just about to lose your patience and you look up and think “I am really here, in Egypt at the pyramids, pinch me”. 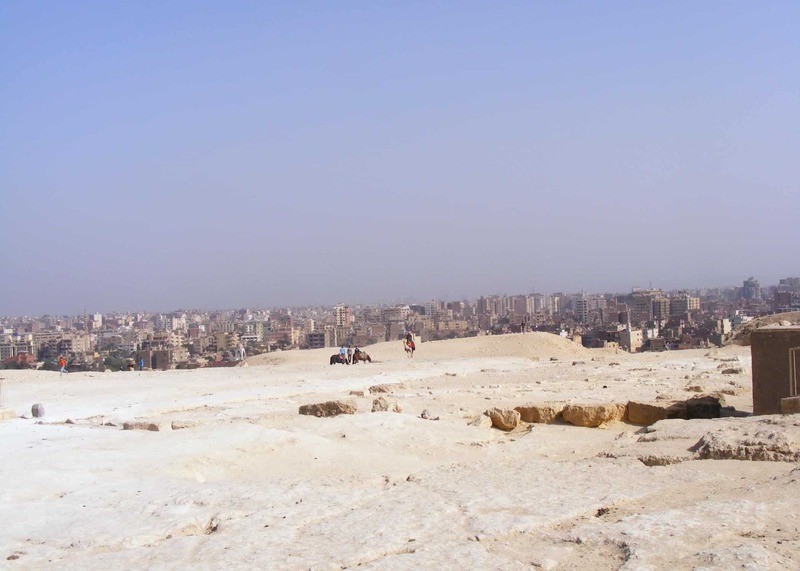 The largest pyramid is that of Khufu (it was called Cheops for years) standing a miraculous 481 feet high. On the Plateau however, the larger pyramid appears to be that of Khafre who was reputed to be Khufu’s son. The apex of Khafre’s pyramid is still in place and the elevation somewhat higher than Khufu so the appearance is deceiving. 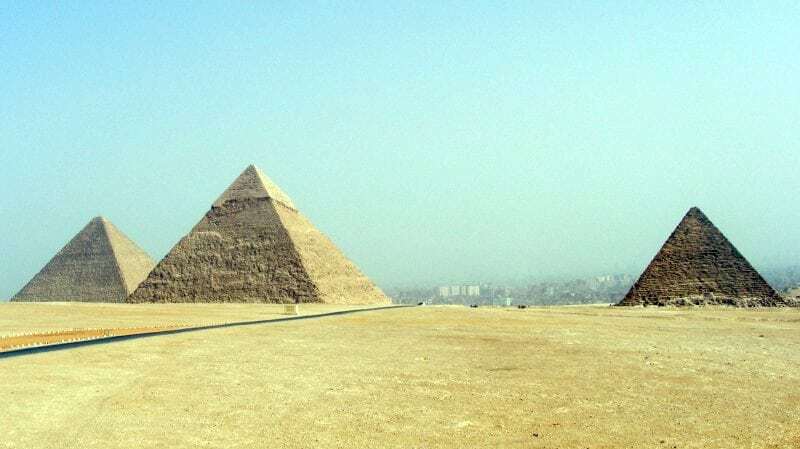 The third pyramid is that of Menkaure believed to be Khafre’s son and several of the smaller pyramids are believed to be that of Egyptian queens. The Sphinx sits below the pyramids in the quarry from where the limestone came to build the pyramids. 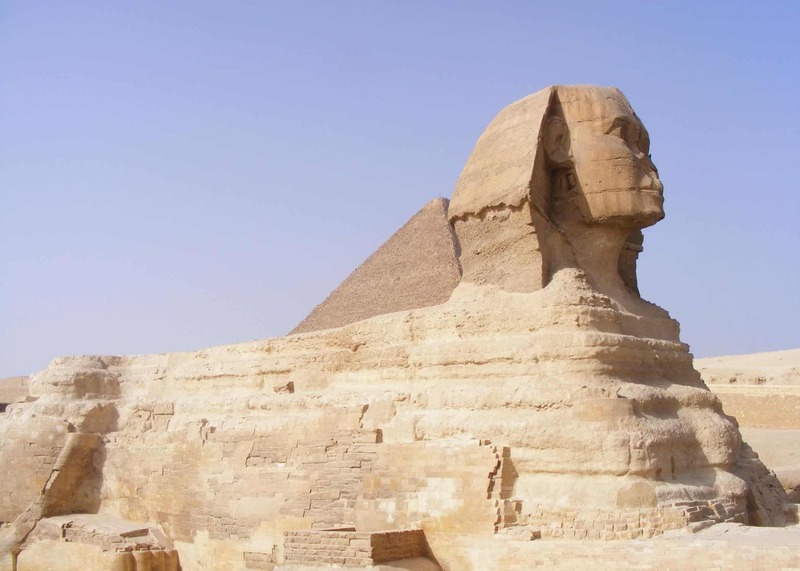 The Sphinx was carved in situ and was for many years covered in sand it wasn’t until 1400 B.C., that part of the Sphinx was uncovered. In front of the Sphinx is the remains of the Valley Temple of Khafre and it is through this and up into Khafre’s causeway that you can walk alongside the Sphinx. The Causeway is the tunnel that was used to bring Khafre’s body to the Pyramid for burial. 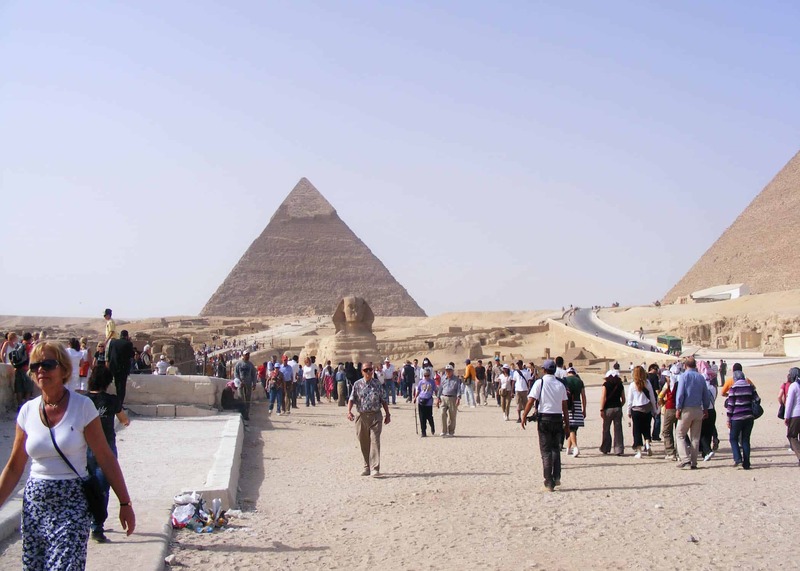 The Causeway that runs beside the sphinx is very narrow approximately 3’ wide and the line goes in and out through the same narrow entry so the crowding is very intense and there is no organizational system to get tourists in and out. The Pyramids were built over 4,500 years ago and the Egyptians who built them believed they were going to become gods in the afterlife. They filled these temples with riches, food, and items they believed they would need in the next life. Unfortunately most of the tomb goods have been robbed over time. 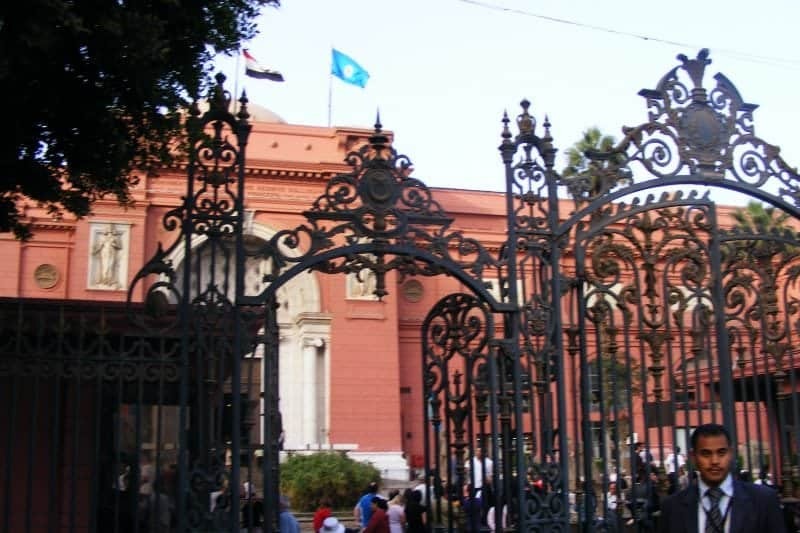 Some like King Tut’s treasures can be seen at the Egyptian Museum in Cairo, but be prepared it won’t be what you expect. 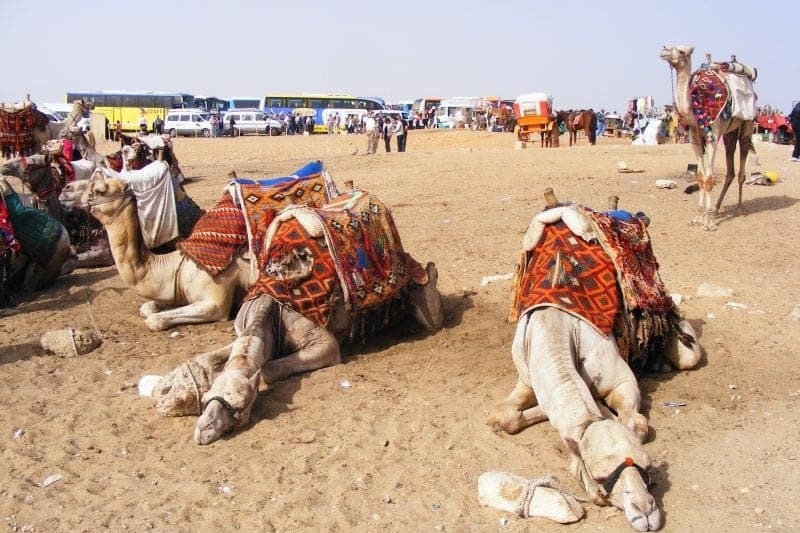 Survival tips for visiting Egypt; take along your own toilet paper, expect lots of sand and dirt, don’t drink the water, the food is great but wash your hands often or bring along the hand sanitizer. Hire a guide you will absolutely be lost without one, there are no signs informing you as to what pyramid you stand before and absolutely no information anywhere in English to explain what you are seeing so get a guide. Use a site like Trip Advisor where you can get a list of guides with references. For those trying to get to Cairo from a Cruise ship the ship itself will host tours and the average cost of a day trip is around $200+ US. This will include the air-conditioned bus from the Port in Alexandria and a guide for the day; however it will be half that price to organize your own guide. Cairo is about two hours or so from the Port and despite worry and talk of armed guards it is perfectly safe. Depending on the time of year the sun can be incredibly hot and the heat completely draining, don’t forget sunscreen, sunglasses and a hat and as the guides say sometimes you have to be down right rude to fend of the hawkers and civil servants who are looking for some baksheesh. Take loads of pictures and revel in the fact that this is a once in a lifetime experience and when you get home you will be watching all the National Geographic Egyptian programs and telling your friends and family “I was there”. If you love shopping (and I do) you must pick up some Egyptian items to bring home with you Lindsay has a great article on Her blog Carpe Diem Our Way on 10 Things you Should Buy in Egypt. I have to say I bought every single one of them home with me…lol.. If you enjoyed reading about the pyramids you might enjoy learning more about Turkey and the White Marble Road, or visiting Mary’s House in the Turkish hills and if you favour the Goddess take a quick trip to the Temple of Artemis.